More recently, we wrote that the concept of Peugeot 208 GTI was observed during the tests. Until recently, all the information about the appearance of new items consisted of spy photos, but now, the French manufacturer introduced a new official images. You can see them inside the publication. In addition to photos, Peugeot told about some of the characteristics of the vehicle. Almost all coincided with the information leaked to the internet before. "Charged" version was developed based on the 3-door Hatchback Peugeot 208. But unlike the original 208 GTI has LED lights, flared wheel arches, side skirts, two chrome exhaust pipes, 18-inch five-spoke alloy wheels, and much more. Under the hood is located 1.6-liter gasoline turbo engine with a capacity of 200 horsepower (147kW). The same powertrain is installed in a model of RCZ. 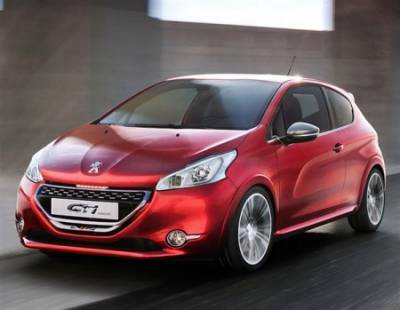 According to the French company, Peugeot 208 GTI can accelerate to 60 miles per hour in 7.6 seconds. It is expected that the production version of the Peugeot 208 GTI will be presented at the Paris Motor Show, and the car will go on sale later this year.